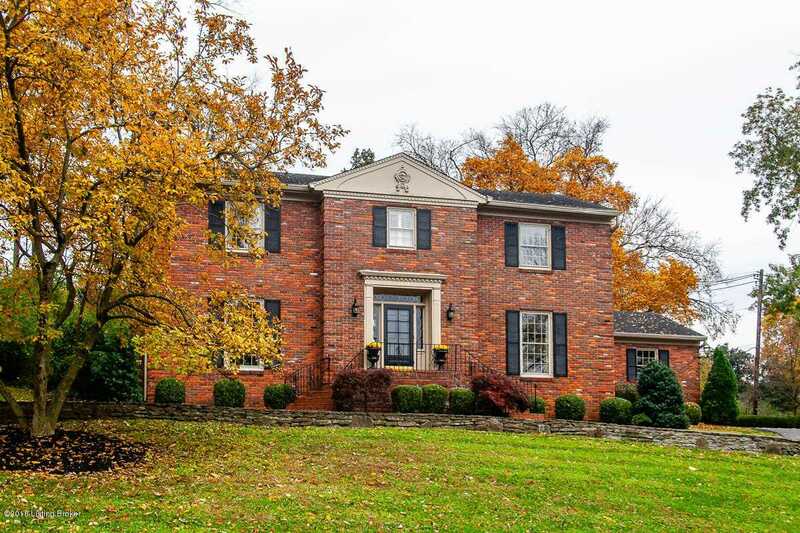 Perched atop a hill in one of Louisville's most dignified neighborhoods, this stately 2-story home is a perfect blend, boasting original character paired with modern updates. Not only aesthetically pleasing, 5214 Eastwind offers a layout perfectly suited for the buyer desiring a space to both live and entertain. The foyer greets you giving way to the formal dining room which is adorned by a bay window and decorative wainscoting. Through the swinging door you'll find the gourmet eat-in-kitchen that provides a beautiful view to the large backyard and offers top of the line appliances, including a double oven, and a pass-through window, opening the space up to the cozy family room on the other side. You'll find any excuse you can to spend time in the gorgeous addition off the family room! This space is peaceful enough to sit and enjoy your morning coffee, bright enough to get lost in your favorite book and has a well-appointed wet bar with granite counters and lit glass cabinets, making it the perfect space to entertain. The second level houses the owner's suite, three additional bedrooms, one with en-suite bath, and a third full bathroom. The finished basement is complete with a fireplace and recessed lighting, making this a bright and usable space. Concluding the home's many desirable features is the private backyard with a patio, accessed by the kitchen and sun room, as well as a quaint gazebo tucked in the back. This home has it all and then some! Don't miss your chance to own this Indian Hills treasure! Directions:US42/Brownsboro Road to Moccasin Trail to Eastwind Road, house on left. SchoolsClick map icons below to view information for schools near 5214 Eastwind Rd Louisville, KY 40207.